More than 70 percent of children ages 5 to 14 (27.7 million) ride bicycles. This age group rides 50 percent more than the average bicyclist and accounts for approximately 21 percent of all bicycle-related deaths and nearly half of all bicycle-related injuries. 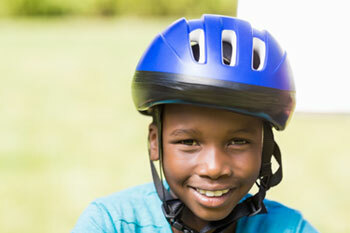 A properly fitted bicycle helmet is the single most important determinant in head injury prevention related to bicycles. (National Safe Kids Campaign 2004). On October 29, 2003, Florissant City Council enacted a helmet ordinance requiring the use of protective headgear for bicycling, in-line skating, roller skating, scooter operating and skateboarding by persons under the age of seventeen. (City of Florissant Ordinance No. 6913). In order to ensure that children in this community have access to affordable helmets the Florissant Valley Fire District sells and fits helmets for $5.00. This service is available Monday-Thursday from 8 am until 4 pm and Friday 8 am until 3 pm at the Florissant Valley Fire Protection District Administration offices located at 661 St. Ferdinand, Florissant, MO.